DVD title: "CADDYSHACK" 30th Anniversary edition. DISC Condition:Excellent. DVD pictured is DVD you get. Overall Condition of DVD:Very Good. My discs are scratch free and are all authentic. I use a top of the line scratch remover if needed. I also replace cases if needed. You won't regret it. Caddyshack [DVD]  [Region 1] [US Import] [NTSC]. 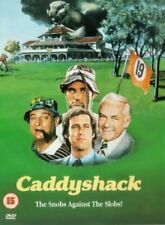 Title:Caddyshack [DVD]  [Region 1] [US Import] [NTSC]. All of our paper waste is recycled within the UK and turned into corrugated cardboard. Buy2Get1 = Buy 2 Get 1 Free. 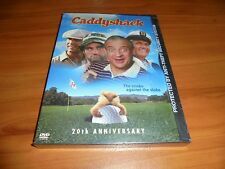 Caddyshack - 1980 (Widescreen DVD, 1999 Snapcase) - Bill Murray. Screenplay: Douglas Kenney, Harold Ramis, Brian Doyle-Murray. Producer: Douglas Kenney. Format: DVD. Very Good Condition. 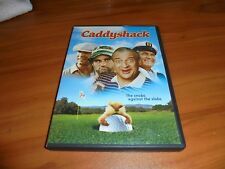 Caddyshack - DVD - Widescreen 1980 BRAND NEW! SAME DAY SHIPPING! Brand new sealed copy. Great value and fast, same day shipping! Our goal is to always provide items exactly as described and lightning fast same day delivery. If you purchase from us before the close of business, your package will ship that day. We only ask that if there is ever a problem with your order, that you contact us directly and allow us to make it right. Our promise is to leave you satisfied at the end of the transaction. Thank you! Original Songs by Kenny Loggins.Directed by Harold Ramis. Theatrical Trailer. RELEASE DATE Back to Top. Over 100,000,000 served. Subtitles:English,French (Feature Film Only). French Mono. Great condition. Only watched once! Original Songs by Kenny Loggins.Directed by Harold Ramis. Theatrical Trailer. RELEASE DATE Back to Top. Over 100,000,000 served. The Snobs Against the Slobs. Spanish Mono.